Preheat the waffle iron according to manufacturer instructions. Meanwhile, fill a large deep skillet with 2 inches of vegetable oil and heat to 375°F. In a large bowl, combine the Bisquick, milk, 1/4-cup vegetable oil, and eggs. Whisk until just combined. Pour batter into your waffle maker and cook as directed. 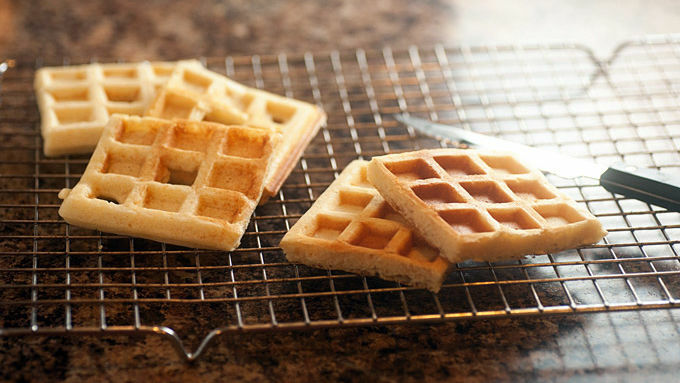 Remove from the waffle iron to a wire rack. Use the smallest biscuit cutter you have (or a sharp knife) to cut small holes out of the centers of some or all of your waffles. 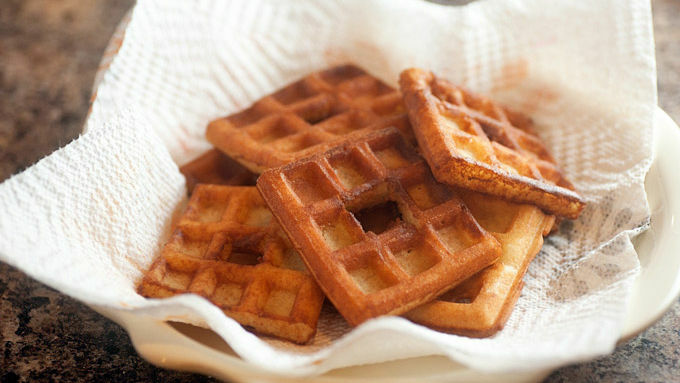 Place the waffles one at a time into the hot oil and fry just until golden brown, about 30 seconds per side. The waffles are already cooked, so frying goes quick – keep a close eye on them or they'll burn. Remove from the oil to a paper towel-lined plate and let the grease drain. 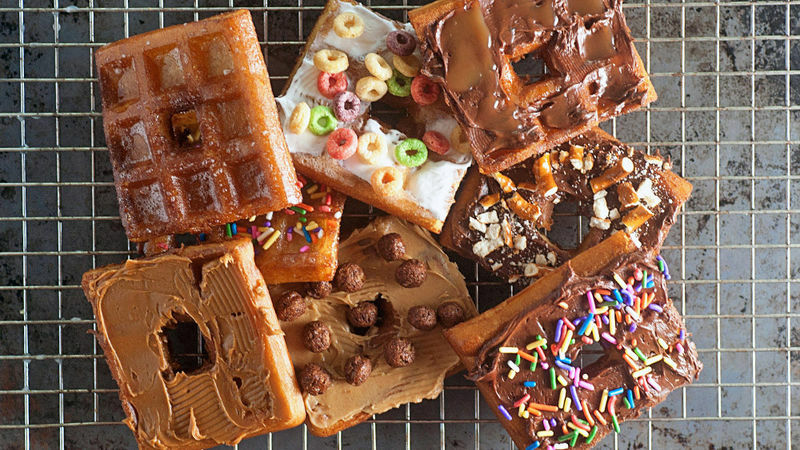 Return the fried waffles to the cooling rack and top with the toppings of your choice – you can glaze them, frost them, cover them with sprinkles, nuts, etc. 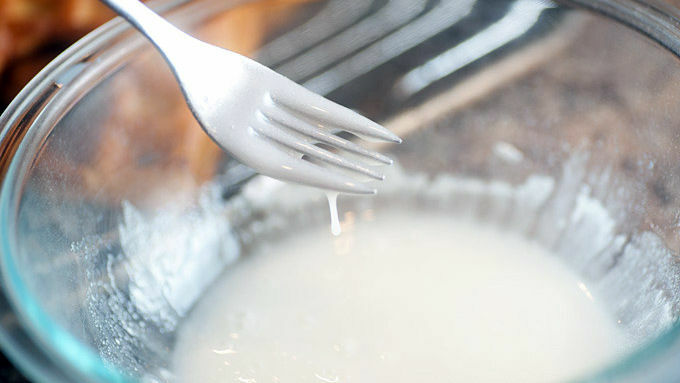 To make glaze, whisk together the powdered sugar and milk. Dunk some of the wonuts into the glaze. Top the rest of the wonuts with any topping you prefer. Some topping ideas are cake frosting, chocolate hazelnut spread, cookie butter, sprinkles, pretzels and cereal. For a birthday cake-flavored wonut, swap half of the Bisquick with dry yellow cake mix! They'll fry up just the same, but be careful when topping them as they're much sweeter than the original version. It's a waffle. It's a donut. No, wait ... it's a wonut!You don't have to go to Chicago to get your wonut fix. You can easily make them right at home. I have a confession to make. You ready? Frying. It’s my jam. I love to fry food and I love to eat fried food. Soooo, I fried some waffles. I mean, what? There is totally and completely nothing at all wrong with that. In fact, fried waffles are taking the world by storm. You’ve heard of the wonut, right? Well, that’s pretty much just a fried waffle topped with all kinds of delicious donut-y things. You guys want these in your face, don’t you?Dunk your wonuts right in the glaze to coat and then sprinkle them with ... well, sprinkles. Chocolate hazelnut spread was a favorite choice amongst my kids. Especially because I topped it with crushed pretzels. Sweet and salty is the way to go! You can’t beat a classic. Chocolate frosting + sprinkles wins at life every time. Grab a box of cereal. Frost your donut with Betty Crocker™ Fluffy White Frosting. Sprinkle on some Fruity Cheerios. It’s not a donut until you’ve slathered it with peanut butter and added some Cocoa Puffs for a chocolatey crunch. Chocolate frosting and a drizzle of caramel ice cream topping makes me pretty happy. Sprinkle on some salt if you’re feeling crazy. For a birthday cake-flavored wonut, swap half of the Bisquick with dry yellow cake mix! They'll fry up just the same, but be careful when topping them as they're much sweeter than the original version. My personal favorite was the cookie butter. I love cookie butter and it’s the perfect compliment to a wonut. Truth. Go forth and fry your waffles! Then top them with every ridiculous thing you can think of.